I received these recipes in an email from "Cuisine at Home" magazine. First of all, I love that magazine. I don't think I have ever disliked a single recipe that I've made from it. And I love that they are so specific on directions. The magazine just rocks. I've even sent subscriptions to several friends. I love it that much! So anyway, I took one look at this dinner and thought, "Oh yeah, I'm all over that one." Incredibly, the only ingredient I didn't have on hand was the cucumber. Go figure. Bob offered to go to the store and pick one up for me. Well hell, as long as he was going I went ahead and gave him the grocery list I'd been working on. Poor Bob. This dinner turned out absolutely delicious. Wow. Sitting out on the deck with a good breeze to clear out the end of the hot and humid day with this dinner before us, and a glass of wine, well that was just heaven. The pork is so good. And the cucumber salad is the perfect foil to the satay. This is definitely a keeper. It's so easy and so good. Go for it! This is one you shouldn't miss! I'm just sayin'. *The marinade for the pork also serves as the basting sauce. Avoid brushing the satay too early, however, or they'll stick to the grill and burn. Simmer hoisin, garlic sauce, honey, vinegar, oil, and salt for the satay in a saucepan over medium-high heat. Cook marinade 5 minutes, then set it aside to cool. Prepare pork, cutting it first into thirds lengthwise, then in half crosswise to make 6 pieces. Finally, slice each piece in half lengthwise to make 12 strips, each 4-6 inches long. Toss pork strips in the marinade, then thread strips onto skewers. Bring water and salt for the rice to a boil in a saucepan over medium-high heat. Stir in rice, cover, reduce heat, and simmer 15 minutes. Remove saucepan from heat. Just before serving, stir in peas and vinegar, fluffing rice until well mixed. Arrange satay on the grill so the skewers extend over the edge; cover and cook 3-4 minutes. Flip satay, baste with marinade, then grill until cooked through, 3-4 minutes more. 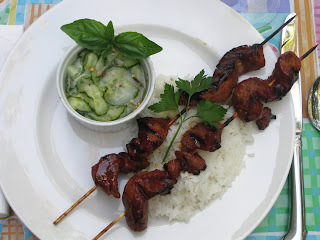 Serve satay with Cucumber Salad. Combine sugar, vinegar, salt, and pepper flakes for dressing in a bowl; set aside. To prepare the cucumbers, cut a cucumber in half lengthwise, then scoop out the seeds with a spoon. Discard seeds. Slice cucumber halves into thin slices to make a yield of 2 to 2 1/2 cups. Toss cucumber and onion slices with dressing until well coated. Chill salad until ready to serve. Salad can be prepared up to 1 hour ahead. Why, it sounds suspiciously like a recipe we ran in FamilyFun! HA! :) The cucumber salad is a big hit -- really tasty! Sounds a lot like a recipe we ran in FamilyFun and I agree, the cucumber salad/relish is fabulous! Sorry about the double posting -- having trouble with my account. It ran in the October 2008 issue, from my favorite food writers, Carla Snyder and Meredith Deeds, The Takeout Menu Cookbook. It's not exact, but, as someone once said, there are no original ideas (or recipes, for that matter! ).